I'm so excited about this soup for so many reasons! First of all, I'm really starting to love my pressure cooker for soups. It is perfect for last minute meals and everything comes out so tender. 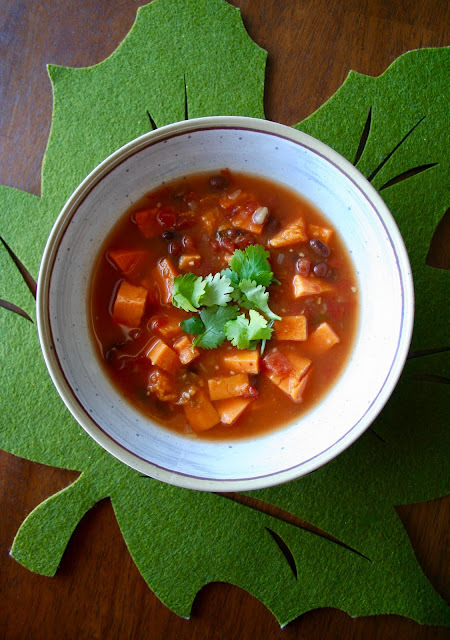 I also love sweet potatoes and black beans together so when I saw this soup I knew I had to try it. Thankfully it was everything I hoped it would be and more! It has so much flavor, the textures are perfect and it makes the perfect fall soup. You really need to try it! 1. Turn on the Sauté setting on the pressure cooker. Add the olive oil, onion, and 1 teaspoon of salt. Sauté for 5 minutes, stirring occasionally. 2. Add the garlic, cilantro, spices and the remaining salt and stir. Add the chicken broth, tomatoes, sweet potatoes and beans. Stir until combined and turn off Sauté setting. 3. Place and lock the lid and cook on High Pressure for 3 minutes. Do a natural release for 5 minutes and then use the quick release method to let off the rest of the pressure. 4. Open the lid and stir in the lime juice. Serve the soup with toppings of choice.